These butter cookies with mocha frosting are made from a universal slice-and-bake dough. The dough for these butter cookies can be made up to two days in advance, or frozen for even longer. When you are ready to make the cookies, just slice the dough, bake the cookies, and spread them with the frosting. If you are a coffee lover, you will love this mocha frosting. There are two tablespoons of instant espresso powder in the frosting (for 3 dozen cookies), so the coffee flavor is strong. And sprinkles!! 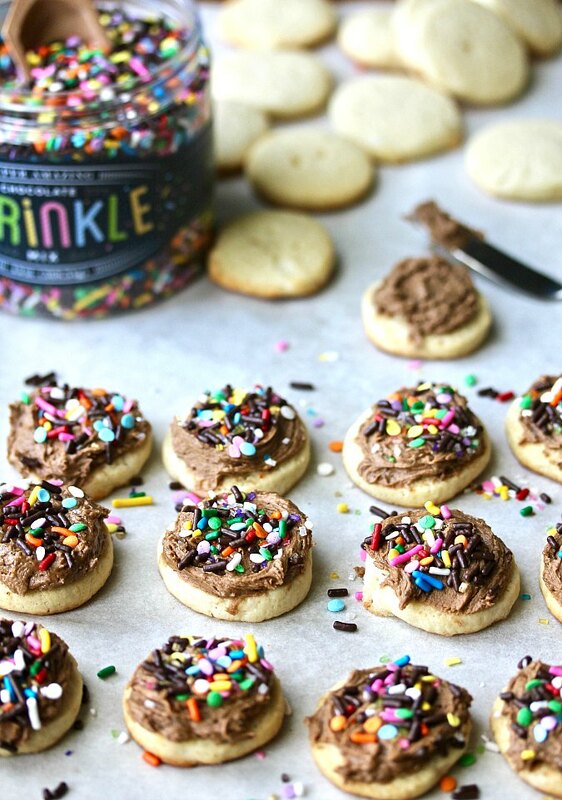 If you want to sell cookies at a bake sale, just add sprinkles. These butter cookies with mocha frosting are great for making in advance. The frosting adds a lot of moisture and sweetness to the butter cookies, and the flavors really meld together well. This month, the Creative Cookie Exchange bakers are making cookies that would be perfect for a bake sale. After the recipe, be sure to check out everyone's posts. Using an electric or stand mixer, cream together the butter and sugar. Add in the vanilla and egg, and beat until fully mixed in. Whisk together the flour, baking powder, and salt. Add half of it to the bowl with the butter mixture. Beat briefly on low to incorporate. Add the milk and beat for 10 seconds. Add the rest of the flour mixture and mix until just incorporated, adding more milk by tablespoon if necessary. Divide the dough into 3 equal parts and roll them into logs with a diameter of 1 1/2 inches. Wrap in plastic wrap and refrigerate for at least 2 hours and up to a day. The dough logs can also be frozen for about a week. Preheat the oven to 375 degrees F and line baking sheets with parchment paper. Slice the logs into cookies and bake for about 10 minutes, until the edges are slightly golden. Cool on a wire rack. Melt the chocolate in a microwave in 30 second bursts, stirring in between. Set aside. Cream the butter until fluffy. Add the powdered sugar, one cup at a time, alternating with the cream, one tablespoon at a time. Add the melted chocolate, espresso, vanilla, and salt, and beat until fully incorporated. When the cookies are completely cooled, frost each one with frosting, and add the optional sprinkles. Store in an airtight container. If you have younger children then you know school starting back up means bake sales. So we are sharing some cookies to give you some great bake sale cookie ideas! You can also use us as a great resource for cookie recipes. Be sure to check out our Pinterest Board and our monthly posts (you can find all of them here at The Spiced Life). You will be able to find them the first Tuesday after the 15th of each month! If you are a blogger and want to join in the fun, contact Laura at thespicedlife AT gmail DOT com and she will get you added to our Facebook group, where we discuss our cookies and share links. This recipe has been slightly adapted from the book Mark Bittman's Kitchen Matrix: More than 700 Simple Recipes and Techniques to Mix and Match for Endless Possibilities. Over 700 recipes in 300 pages! This recipe came from the section, Cookies +12 Ways. I'm spending a year cooking through sections of the book with Wendy of A Day in the Life on The Farm and Camilla of Culinary Adventures with Camilla. Mocha frosting?!? Yes, please. I have some cute sprinkles I need to use. I will definitely give these a try. Thanks for picking this theme, Karen. Thanks Cam! 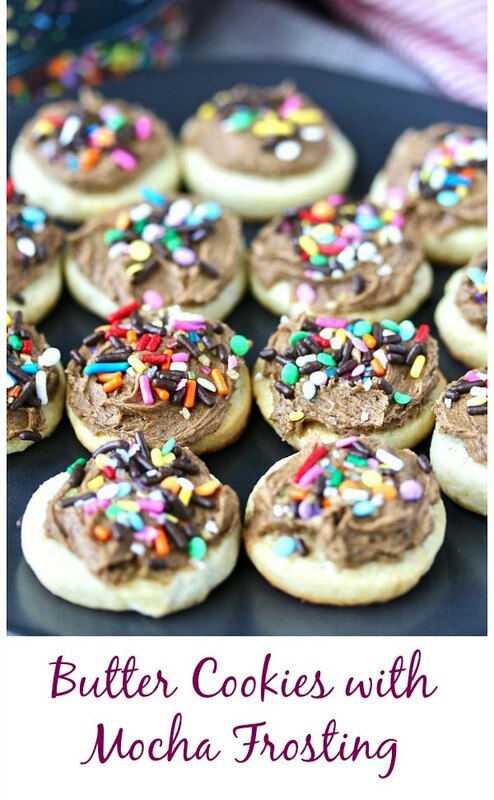 Yes, it's like getting your coffee in a cookie... and sprinkles make everything better. Haha. Oh, no! I would eat the cookie and wash it down with my coffee. Nothing replaces my liquid energy. LOL. I am not a huge frosting fan but this mocha frosting is yelling my name. If my daughter saw these she would go nuts! And yum all that instant espresso. Thanks Laura! She must be a sprinkles fan! All the pretty sprinkles and coffee to boot. These would be the first thing I run to at the Bake Sale table. Hi Mirella and Panos. The coffee is dry and not reconstituted. It's a fine powder. I hope you enjoy it!